Oh Summer, how exciting! We can’t wait to hear all the details! Congratulations on doing so well in the show, that is awesome! What an amazing trip you had….can’t wait to hear about the rest of it! You did so well! I am thrilled! I wish I could have come to see you. I live in Eastern WA and Portland might be as close as you ever come! Maybe next year! I think ALL the ribbons are belong to you! I can’t believe what a good girl you are, so calm and serene. You make me a little ashamed of myself. (Okay, no, not really but *almost*). 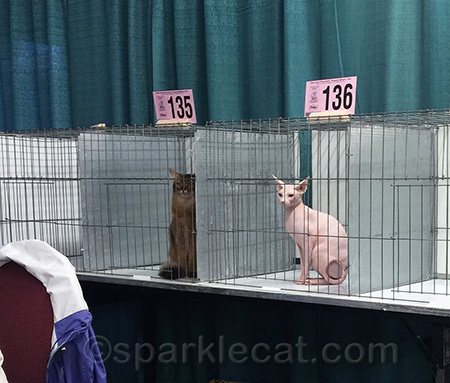 Concats on your ribbons and ring finals, Summer! 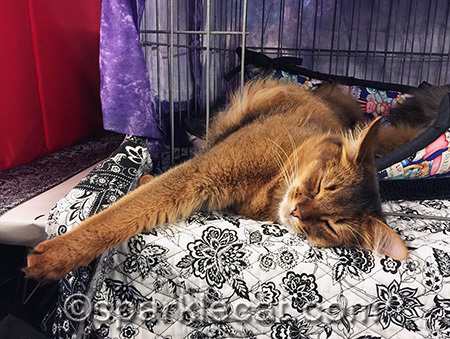 we liked seeing you having some fun there during your down time 🙂 the Persian and Sphynx are beautiful kitties! 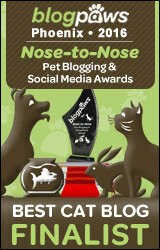 That is a cool idea to have adoptable kitties compete in the pet category. 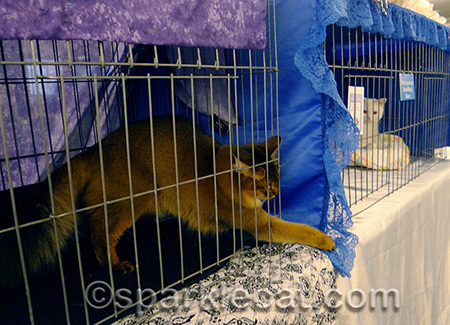 we don’t think we knew about that part of cat shows. Concats on the St. Paddyâ€™s Day color ribbons! 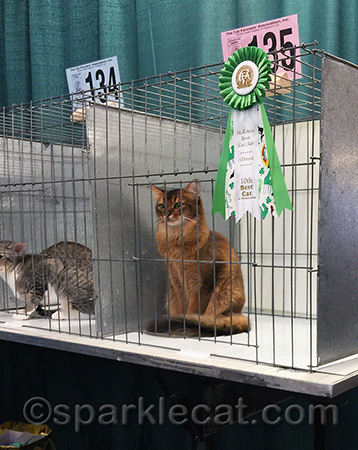 Aunt Karen sometimes brings her fosters to cat shows. You’re always a winner in our book! Wow, Summer! You really did well. But we’re not surprised at all. We can’t wait to hear more about the show. Summer, you can be a little imp, you know it? But concats on your wins! Oh, and guess what? My mom’s original cat’s name was Bing! Only she was a girl. Sounds like a successful weekend! 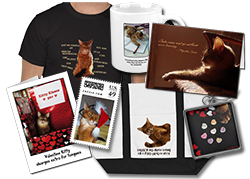 We didn’t know that adoptable cats were showed to help their appeal to potential adopters. Congratulations on all those beautiful ribbons, Summer! You really are becoming a pro! There’s no stopping you, Summer!! ConCats on your achievements! You do get around! Concats on winning all those ribbons Summer. Looks like the curtain was almost as much fun to play with as the toy. Concats, Summer! We bet those ribbons now weigh more than YOU do! Wow! You did great, Summer. 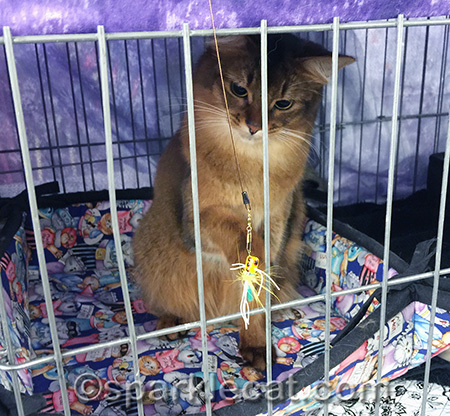 I really liked reading that part about ribbons helping rescue cats get adopted. Can’t wait for the rest of the story. Can’t wait to hear the rest! Congrats on all your ribbons! That is so neat about the rescue kitties. That is great sweetie. You are just a “winner” all over. You certainly are in our book. Love your new toys. Now what red blooded cat could possibly resist playing with those. Wow! Summer! Yous is one rocking kitty! And wes so proud to knows yous! Pretty soon, your human is going to has to creates a whole ROOM just for your ribbons! And Summer, how does yous find time to comment and visits when yous so furry busy? We has been totally intrigued with watching what happens at the shows, it is so furry intesting! Big concats on all those ribbons! And fur doing so furry well! Yippee for more ribbons! We knew you would do well and we hope you come to think of Portland as a lucky show city for you! Concatulations, Summer! You did pawtastic! We can’t wait to hear about the rest of your trip. Oh, anwe LOVE the part about the rescue kitties. Summer that was an awesome job. You don’t need to practice your cute, you are organically cute sweetie pie. WOW you did amazingly well! That’s awesome! Hey, if you want a fun show to come to…there’s this little thing going on Columbus Day weekend in Sturbridge, MA…. Congratulations on all of your ribbons, Summer!! The white Sphynx is really beautiful. 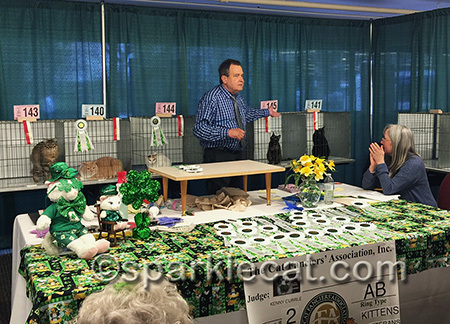 We think it is pawesome that shelters take their kitties to shows to get them ribbons, too. Many concats on all your ribbons, Summer! You did so well! Mommy was very impressed with you and your professionalism, and happy to meet both you and your mommy. 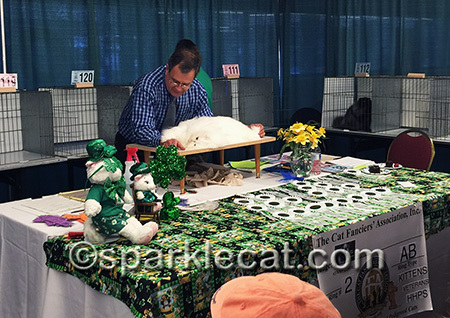 Thanks for introducing us to the world of cat shows! i live in portland and didn’t know about this. 🙁 would have loved to come see you and all the other kitties. maybe next time. congratulations on all those ribbons! Congrats beautiful Summer, we are always enchanted with you! Concatulations Summer! Our mommy knew you’d get more than the first one she saw you win! Yay for the Tortie too! ConCATS, Summer!!! Cat shows sound like a lot of fun. We wonder if there are any in Georgia! Saw your video on FB – you are such a natural! Oh Summer, we are so proud of you for doing so well. And you got to meet all all kinds of nice bloggers. We can’t wait to hear about the plane ride etc. Your career is really taking off. We are so proud to know such a celebrity kitteh. Concatulations! 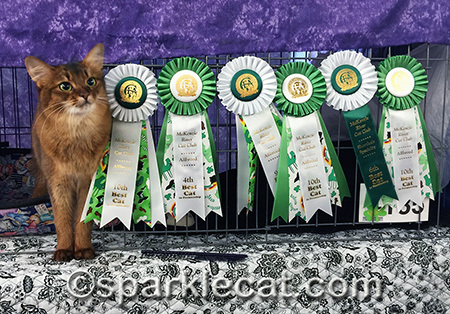 Congratulations, Summer, on all your ribbons, they’re well-deserved! Wow! How exciting! So many ribbons – congratulations, Summer! You are such a STAR, Summer! 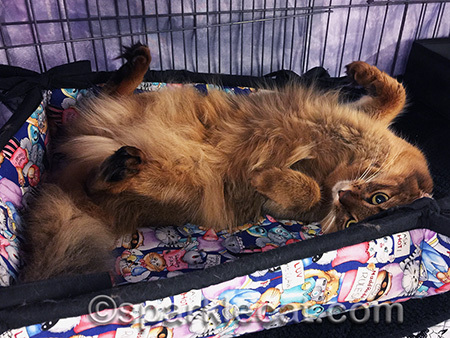 We love the photo of you practicing cute! Oh Summer just look at all those ribbons! Concatulations! Sounds like you had a lot of fun in Portland too – can’t wait to hear more! You did really well Summer! Oops, that was out typist. Congrats Summer! You don’t have to practice being cute, you are a natural!